If you're a Papergang subscriber you will be aware of the Happy New Year garland on the back of your Papergang boxes this December! Featuring a wide selection of groovy shapes, it's the snazziest D.I.Y around. Want to know how to bring it to life? Simply follow the easy steps below! Missed out on the box? We've made a printable file for you to download too! (Link below) Share your creations on Instagram with #papergang and #ohhdeersadvent. Don't miss out on January's box - head over to papergang.ohhdeer.com to get signed up (Hint: this box is HELLA cute). Your Papergang Box or The PDF below! Cut out all the shapes and letters (we suggest whilst watching home alone with a mince pie and a brew). 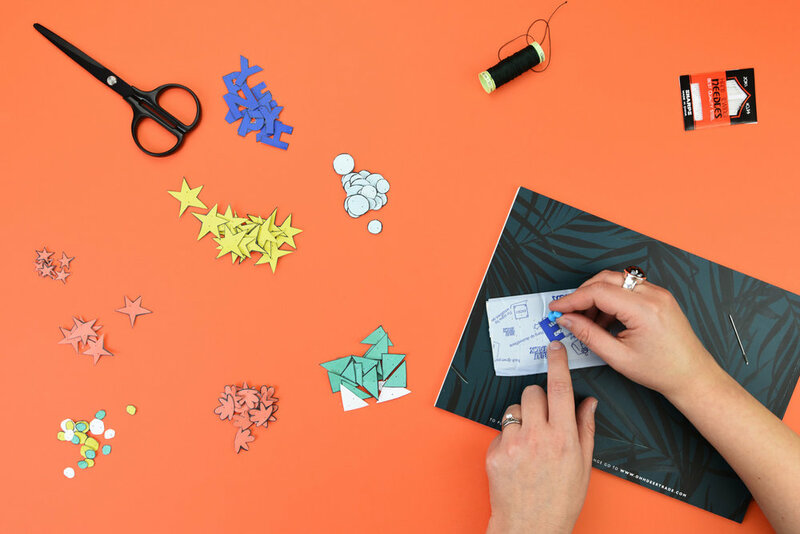 Place your pieces onto a cutting mat (or something you don’t mind getting lots of holes in like a thick magazine). Pierce 2 holes in each shape - these holes need to be equally apart from the center of the shape, say around 1cm from one-another (shape depending). If you have a Papergang box, these holes are already marked for you on each shape. You could do this using a compass, your sewing needle or a push pin. Cut piece of thread as long as you’d like your garland to be (the final thing could be one long piece, or a few shorter pieces layered up! ), then pass the needle and thread through the holes. Stitch the pieces together as closely, or far apart as you like, depending on the effect you want to achieve! Make as many or as few garlands as you like, we went for a nice selection of 4. Hang on your bedroom wall or make it pride of place at your New Year party! Do not hang near open flames. Proud of your creation? Tag us in your festive photos with #ohhdeeradvent!